Offenses have shifted to a primary focus on the passing game over the last decade. However, there is one team that has taken their passing attack to the extreme. Doug Storms looks at how effective the New England Patriots have been when throwing the ball on over 80 percent of their plays. NFL offenses have come a long way since the days when it was widely believed a team needed to establish the run to set up the pass. More recently, much has been made of the possibility that certain kinds of passing games, especially ones that employ short passes and rub routes that allow the quarterback a quick release, might serve in large measure as an acceptable substitute for a rushing attack. The New England Patriots, though, seem to be able to push this approach of successfully abandoning the ground game beyond that which had ever previously been considered. 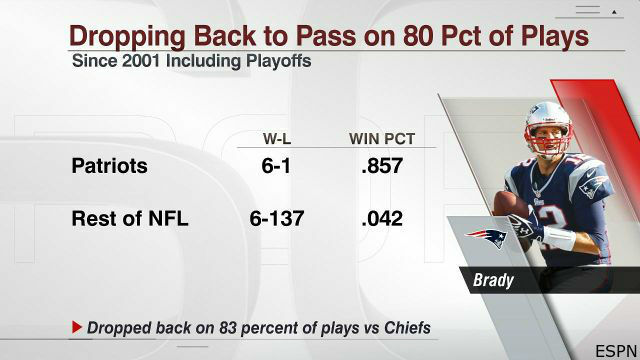 After the Patriots defeated the Kansas City Chiefs in the AFC Divisional round, ESPN displayed what seemed to be an astounding stat: From 2001 to the present, the Patriots were 6-1 when dropping back to pass on at least 80 percent of their snaps, while the rest of the league had a 6-137 record when doing the same. Using the Team Game Finder tool on Pro-Football-Reference.com, I was able to identify the seven Patriots games that fit the criteria. Notably, three of the seven times the Pats have had at least a 4:1 pass:run ratio have occurred during the 2015 season. With only Kevin Faulk and Cedric Cobbs registering carries, the Patriots ran the ball just six times for a mere five total yards. Tom Brady was sacked four times and the team committed four turnovers. It was the only game Corey Dillon missed that season, and the only loss (34-20) among New England’s seven most pass-heavy outings. At first glance, it would look like this game shouldn’t qualify: 54 pass attempts and 16 rush attempts does not equal 80% – it is just 77%. But two of the runs were by Brady ‒ scrambles from the pocket on third and long. Add two sacks allowed, and the final numbers are 58 dropbacks and 14 designed run plays (81%). New England’s last four offensive plays were run calls, and that occurred only after the Eagles burned their final timeout; three Laurence Maroney runs before a punt, and a Brady kneel down after an interception sealed the 31-28 win. December 9, 2007, home versus the Steelers. Late in the second quarter –after Pittsburgh had pulled within one point the Patriots went to the two-minute drill – exclusively passing to get in range for a field goal to extend their lead to 17-13 at the half. Their next three drives also employed no rushing attempts, and those drives ended: touchdown; touchdown; field goal. This is yet another instance where abandoning the pre-game game plan – and the run – proved a winning strategy, as New England coasted to a 34-13 win. Known as the eligible-receiver game, this contest featured a truly pass-happy game plan from Josh McDaniels. While 51 pass attempts falls short of 80% against 13 runs, two sacks of Brady push the percentage over 80. Down 28-14 in the third quarter, New England abandoned the run, using just a quarterback sneak and three kneel downs to close out the game. Shane Vereen was the only running back on the roster to touch the ball in the second half of New England’s 35-31 victory. 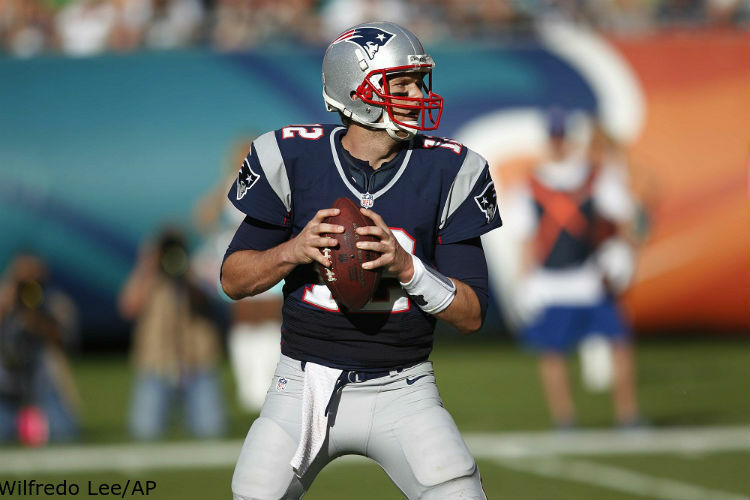 Brady threw 59 passes –second-most in his career –and racked up 466 yards, also second-most in his career. As with the Ravens playoff game, it was almost not enough to account for 80 percent of the Patriots’ offensive plays; New England mixed in 15 rushes for 56 yards – just enough to keep Buffalo’s defense guessing – and prevailed 40-32. The Bills broke through to sack Brady twice, one time to force a fumble that set up a touchdown. The two sacks push the passing rate over 80 percent. With Dion Lewis inactive, New England mustered only 16 yards on just 9 rushes against one of the NFL’s best run defenses. Brady was the team’s leading rusher, tallying four rushes for 15 yards and one touchdown. The Patriots instead attacked through the air to the tune of 54 passes for 355 yards to shoot down the Jets 30-23. In the AFC Divisional playoff game, the Patriots ran the ball 14 times for an anemic 38 yards. Take away the more unconventional rushing plays – Brady’s 10-yard dash to the pylon and Julian Edelman’s end-around for 11 yards – and New England ran 12 times for a measly 17 yards. The passing attack, though, was effective: 42 passes for 302 yards and two touchdowns, including a score on the opening drive that gave them a lead they never relinquished en route to a 27-20 win and a berth in this weekend’s AFC Championship Game. Three of the seven instances where the Patriots have thrown more than 80% have taken place in 2015, and twice in two playoff seasons the game plan has been to throw. New England ended the season ranked 25th in the NFL in rushing attempts, partially because of Lewis’s Week 9 knee injury ended his season, but also because their passing game has proven it can win games when throwing more than 80% of the time. Follow Douglas Storms on Twitter @stormsorama. Douglas Storms is Inside The Pylon‘s numbers man; each week he looks at the stats to find themost interesting and possibly impactful data about the matchup. Doug Storms is a transplanted Nutmegger in Boston. Growing up as an avid Red Sox fan, he developed a passion for statistics and writing. He enjoys bicycling and photography on occasion, and has been following the Patriots since the days of Steve Grogan and Mosi Tatupu.